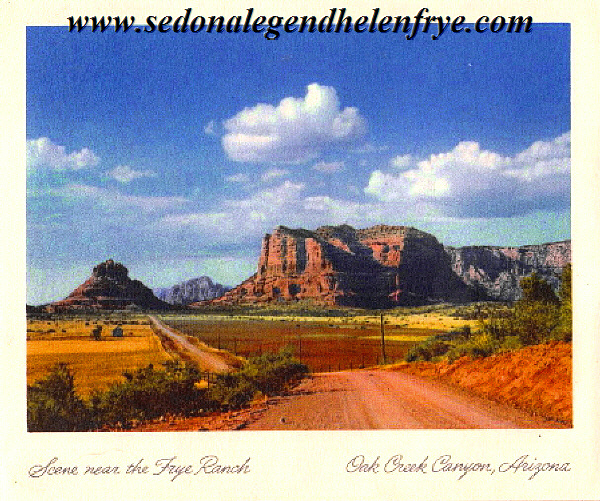 Sedona Legend Helen Frye- the Jack and Helen Frye Story! The Jack And Helen Frye Story! dedicated exclusively to the legacy of Jack and Helen Frye! does it seek or has it ever accepted a single donation. It is an independent venture. representing Jack and Helen Frye. even at only a third of its original acreage is currently worth approximately 125 million dollars. owned by the City of Flagstaff for its water rights). Another Frye ranch above Williams AZ. rather designed to be comfortable and functional, a reflection of the lifestyle they truly loved. overview of the Jack and Helen Frye estates back east see Page 1943 and Page 1939. 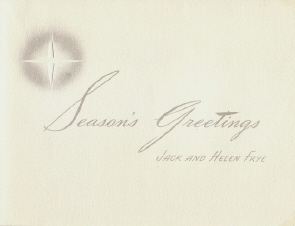 After Helen and Jack went their separate ways in 1950. 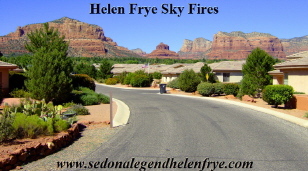 Helen built two other homes in Sedona. picturesque- the property is graced with reflective ponds and lovely golf greens. What of this "Sky Fires" House? Arts Building at Airport Road and 89A in West Sedona. To the right is Faye at her home. 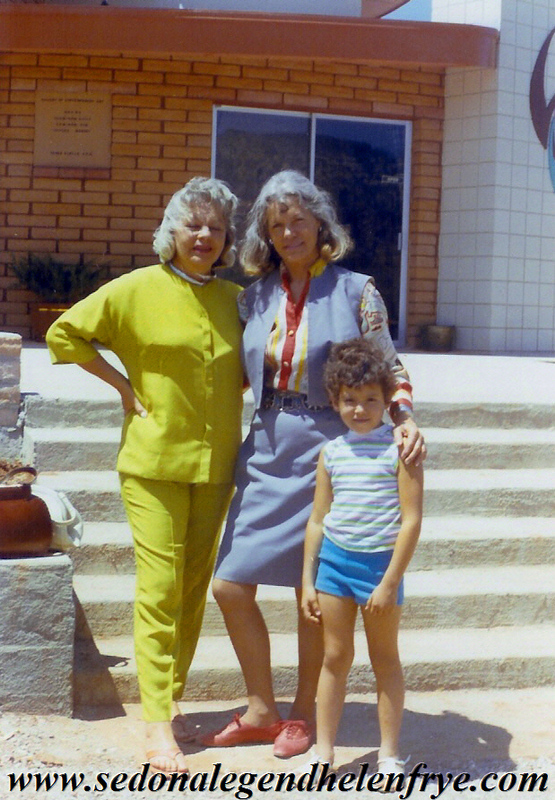 Images were from about 1967 and are courtesy of Helen's dear friend Rosie Targhetta Armijo. Helen's twin sisters. Up until it was sold a young friend of Helen's resided at the property. Some say he owned the house but Helen's family has assured me this simply is not true. the infamous dwelling and an overview of Helen's intention with the project. 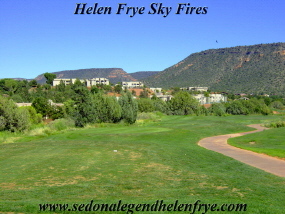 The following description of "Sky Fires" was provided to Sedona Legend by one of its builders. To view the color drawing full size please click on the thumbnail as shown above. clear grassy land near the front entrance. The unpaved driveway began at a steel farm gate. native scrub and bare red soil with loose rocks here and there. Back then, the area was still on the fringes of the township. The only sound was the wind. "Sky Fires" was inspired by the spectacular sunsets that could be seen from this vantage point. externally as a preservative. Doors and widows were standard metal frame with sliding glass. which had the unexpected feature of "creaking" as it expanded in the sun. before backfilling. Unfortunately, it eventually filled waist-deep with rainwater seepage. 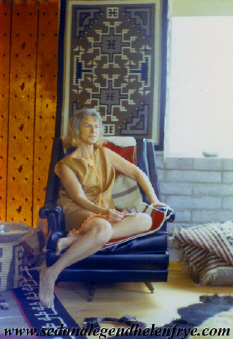 was to become her final dream home in Sedona. the housing of construction workers. Opinion of Sedona Legend editor. 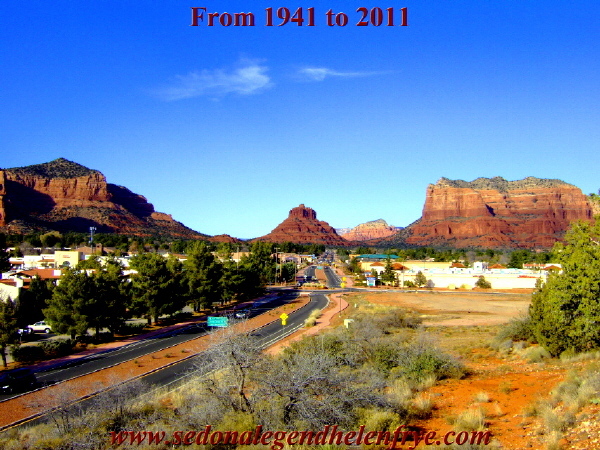 Rumors spread like wildfire in this small town of Sedona but they cannot always be confirmed. New Year's Eve after Helen Frye's death. After much research I have found this to be untrue. upon the "group". That explains the motivation if there is any truth to it. was it the right location and date? More investigation was needed. upstairs. The upstairs walls were studded but not finished." they found out it was a Helen Frye property, and associated with a Eckankar. of the Sedona Fire Department's finest without a doubt! Sky Fires- Not to be Re-claimed! hounded to complete Sky Fires and transfer title to the property. She refused to "hand it over"! 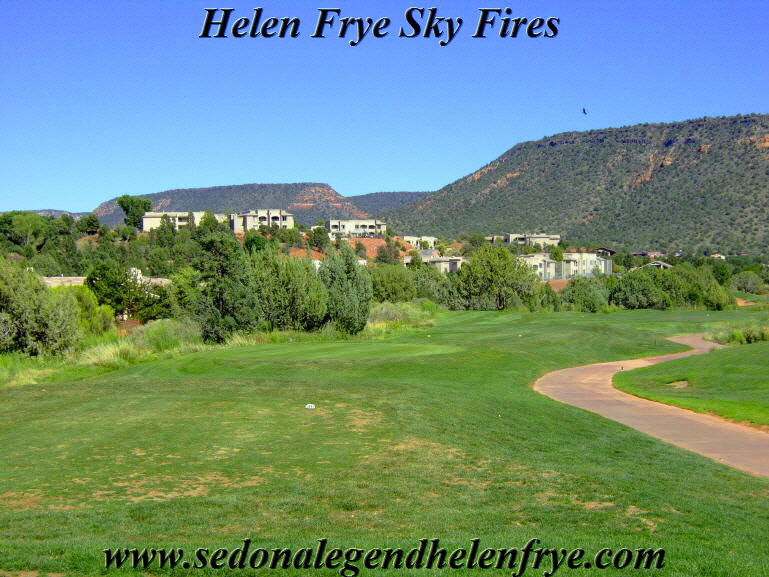 Sky Fires would remain hers until it became ashes- the Sedona winds scattered it back to dust. Frye house was said to have sat on the highest elevation of the area overlooking the Village. elusive as old photos of the dwelling. extensively over this area and the Red Rock Country. This is evidenced by a very famous photo Jack Frye captured of “Big Park” as shown above. initiated with Sedona in 1941, and a photo that turned out to be extremely marketable! celebrity homes; many who moved here were personal Hollywood friends. 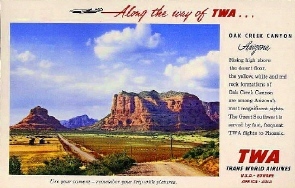 Frye for mentioning the lower Oak Creek Canyon area through TWA publicity. President, Transcontinental and Western Air, Inc.
anxiously awaiting snow for Christmas! and a Hearty Welcome “home” when you can come!" on Patrick Chateau's TWA Paris CDG Charles de Gaulle Airport Website, here and here. 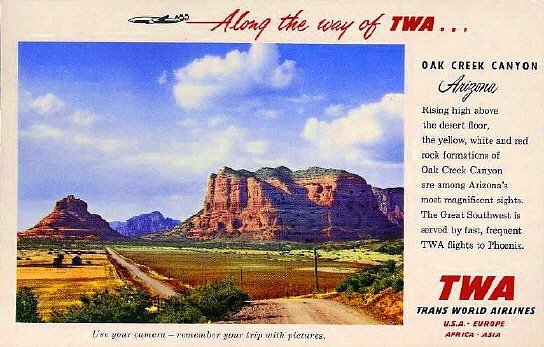 York to Los Angeles, this type of free publicity is welcomed by residents of Northern Arizona." possible to the location where the Fryes likely snapped their Christmas Card photo in 1941. Helen Frye" 1941-2011. "Happy New Year and I hope your Sedona experience is unsurpassed!" Please click on any image for an enlargement.